Mil was personally involved in the development of pre-war A-7 autogyro equipped with machine gun for its own defence and two more for ground targets destroying. However, this type did not reach mass production. But Mil was since that time thinking about arming the rotorcraft, especially after his practise during design of several Bratukhin helicopters, of which some models were intended for artillery spotting and clearly showed that helicopter can play an important role in the army and can be a part of front line units. When the Mi-1 helicopter was test flown for the first time on 20th of September 1948, it was clear a very versatile type was born. It became the first mass produced soviet helicopter with vide variety of special variants both for civil and military applications. It has just entered the regular service with the Soviet Army, when US forces used their Bell OH-13s for attack missions in Korean War. American helicopters were equipped with Bazooka launching tubes and although the firing accuracy was not the best one, it was an important step forward showing which way the further utilization of helicopters in the army may go. In the same time French Air Force deployed its mix of domestic and US origin armed helicopters in Algeria such as H-34A Choctaw, SO.1221 Djinn, Alouette II and Bell 47G-2. This conflict, which was the largest one after the Second World War, showed how much the armed helicopter may help to ground forces. Soviet experts observed results of both countries and paid special attention to deployment of armed helicopters. This is why in late 1950s the idea to arm the Mi-1 was raised at the central headquarters of the Soviet Army. Mil initially agreed to start working on upgrade of the helicopter for carrying unguided and guided weapons. Army headquarters was impressed by the idea of having flexible tank buster armed with anti-tank missiles, of which the development made a giant step in the recent years. In 1958 Mil design bureau officially launched the project of arming the Mi-1. As a result of six months of development a Mi-1MU variant equipped with TRS-132 unguided missiles stored in RO-132 launching rails was presented. One prototype Mi-1MU carried two hardpoints, each equipped with six launching tubes for the aforementioned 132mm calibre rockets. Those rockets are the same as used during WWII on Polikarpov I-15, I-16 and I-159 fighters. During the live firing tests rockets with fragmentation and armour-piercing warheads were tested. The following year the prototype was also equipped with various combination of Kalashnikov and Nikitin machine guns. However, this was still not good enough for the army headquarters to accept the Mi-1MU. Therefore in 1959 a new variant armed with two to four 3M11 Falanga anti-tank guided missiles was introduced. Between 1961 and 1962 the prototype successfully passed state acceptance trials and was recommended for regular service, but this idea was never materialized due to unclear concept of the soviet army development at that time. Although the army did not order a conversion of produced Mi-1 helicopters, Mil´s team continued to work on the project and in 1965 introduced an upgraded variant armed with four modernized 9M17 Falanga or 9M14 Malyutka anti-tank guided missiles, or optionally with special pods with heavy calibre cannons. However, also this project failed, because the Mi-1 type was at that time no more in production in the USSR and even the license production in Poland was nearing its end. Therefore the Mi-1 type was used in unarmed configuration, but gave to Mil design bureau important knowledge and experience. Curiously, although the Mi-1 type was not the most powerful one, the flight characteristics of the armed variant were not bad at all, especially when in the latter modification single person both piloted the ship and operated the weapon system. On 30th of April 1952 medium size Mi-4 helicopter performed its maiden flight. 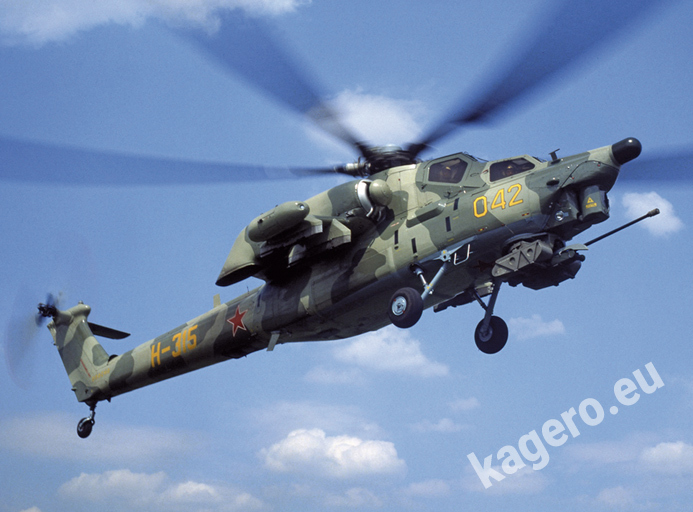 This model became much more attractive for arming, as its payload was several times exceeding the light Mi-1. In 1958, when the serial production was on full rate, two prototype armed variants were started to be designed. Both were designated as Mi-4AV, but carried different armament. Next to the standard Afanasyev A-12,7 machine gun in the gondola under belly, the first variant was equipped with six UB-16-57UMVP blocks for total of 96 pieces of 57 mm calibre Folding fin aerial rockets, while the second one was armed with six TRS-132 blocks for total of 36 pieces of 132 mm calibre rockets. Both variants were finished in 1960 and have entered state acceptance trials. It took almost five years to complete them, mostly due to low intensity interest of the army. As a result of the tests the former variant was accepted and Mil design bureau was given a task to prepare a serial variant of the armed type. In 1967 the final configuration was revealed. It was able to carry not only six UB-16-57UMVP blocks or alternatively up to six 100 kg free fall bombs or four 250 kg bombs, but also four 9M17M Falanga anti-tank guided missiles guided via K-4V sighting and guidance system. This is how Mil design bureau has finished its first successful attack model, which entered regular service. In total 185 Mi-4AV helicopters have joined the Soviet army and some more helicopters were delivered to Afghanistan, Egypt, Iraq, Jordan, Sudan, Syria and Vietnam. Although the domestic operation of the type including participation on large military exercises with involvement of live firing was very intensive, it was the export experience which brought to Mil bureau the incredibly valuable expertise from deployment in real war theatre. For example Egypt used its Mi-4AVs against Israeli tank units with some very positive results. This was the first use of soviet attack helicopters in high intensity conflict. The deployment of Afghan Mi-4AVs, partly piloted by soviet crews, showed many drawbacks of the concept, especially insufficient power in hot and high conditions. Mi-4AVs belonging to the Soviet army were also involved in the defence of Playa Giron beach during unsuccessful US invasion on Cuba. When the twin engined variant of V-8 helicopter, later in serial production known as Mi-8 was flown for the first time on 2nd of August 1962, it was clear the type will be armed soon as well. The first armed variant Mi-8TV was equipped with the armament system from Mi-4AV including K-4V sighting system and UB-16-57UMVP FFAR blocks. It has also inherited the obsolete A-12,7 machine gun in the nose operated by hand grips manually. This variant was introduced by Ulan Ude manufacturing plant under lead of Mil design bureau. Based on lesson learned from Mi-4AV deployment the Mi-8TV was equipped with additional armouring providing ballistic protection for both pilots. In 1974 also the second production plant from city of Kazan has finished its own attack variant, also under lead of Mil design bureau. 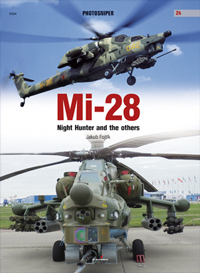 For confusion it was also referred to as Mi-8TV, but it was far more capable. It had for the first time a real nose turret NUV-1-2M for the A-12,7 machine gun, which was still aimed manually by moving the gun on joint, but it was equipped with electrical power supply and belt for ammunition feeding (ammo was stored in the cargo cabin). Six weapon racks on sides were capable of using UB-32A-24 FFAR blocks with 57 mm calibre S-5 rockets. Each block could carry 32 rockets, which is two times more than UB-16-57.